Businesses affected by flooding in Todmorden can now get free help to make themselves stronger and more successful. The UCVR Business recovery team, with funding from Todmorden and Calderdale Councils, has launched a mentoring scheme that offers one-to-one support for any local business affected – directly or indirectly – by the floods. Sarah visits each business to talk through their needs and matches them with a mentor. The mentor and business then meet at least once a month for a minimum of six months, working together to tackle challenges and come up with action plans. Those plans could cover anything from making premises more flood-proof to improving marketing and publicity to win customers. 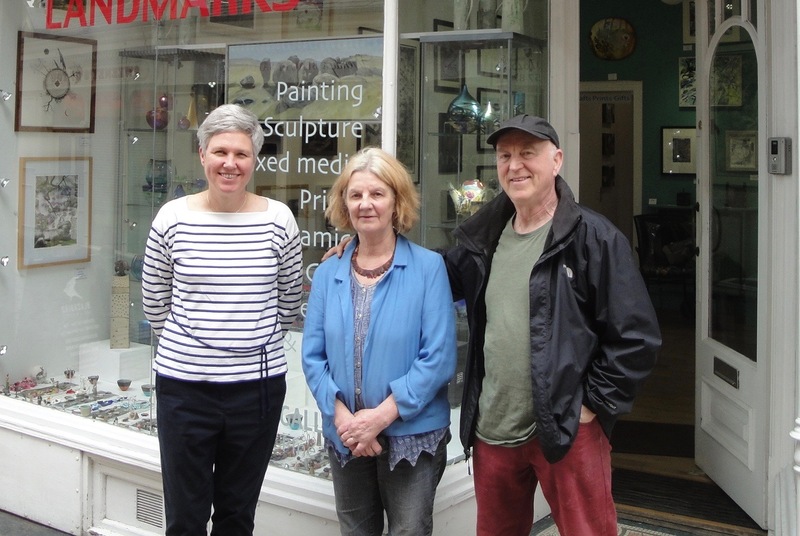 Rosemary and Mike Holcroft, who run the Water Street Gallery, are one of the first businesses to take part. “It’s so helpful, after six months’ hard work refurbishing the gallery, to know we have business and moral support available in the next six months,” says Rosemary. As well as the benefits for businesses, the scheme offers mentors the satisfaction of sharing their expertise and often helps them in their own careers. And Coun. Barry Collins, Calderdale Council’s cabinet member for regeneration and economic development, said they were pleased to be supporting this scheme. At the UCVR we said we would not let up in the pursuit of long-term economic support for flood affected businesses in the Upper Valley. We said that when the welcome, but short-term crowdfunding and social media support had dissipated, we would still be there fighting the corner for those businesses who face an uncertain economic future and or long recovery period. The Economic Impact Report you will find on this website here is a direct result of the UCVR brokering a joint study between University of Leeds, Calderdale Council and the UCVR. It is a comprehensive report which will serve to inform the case for regeneration and recovery investment for the whole borough. As the report highlights the fact that the majority of businesses directly affected were in the Upper Calder Valley we will be lobbying for a lion’s share of any such investment. Since Boxing Day our volunteers have put in over 600 hours to make the case for inward investment and this report will support that work over the coming months, as we continue to make efforts to keep the plight of our local economy in the media and political eye. Our thanks go to Dr. Paola Sakai, University of Leeds. Fiona Thurlbeck, Anne Holdsworth, Luke Doran and Chris Whitaker, Business and skills team at Calderdale Council, who all played crucial roles in bringing this significant report to the Calderdale Flood Commission and other bodies reporting to Government. We would also like to thank all those businesses affected directly, and indirectly, who took the time to complete the comprehensive survey. It was vital to have your co-operation. Our special thanks to those businesses that allowed us to include them as the ‘face behind the business’ case studies. Thank you to all those who completed our survey to gauge a response to Calderdale council’s announcement that they were considering significant increases in the parking fees in the Upper Valley. Having worked so closely with Calderdale since the floods, on behalf of the businesses in planning a long-term recovery, we were extremely surprised at the timing of the announcement. Our concerns about this effect on recovering business (economically and on morale) are reflected in the comments of some 200 respondents. Nearly 500 of you responded and the results are a massive rejection of the proposals by businesses, shoppers, residents and visitors. Guess how much businesses lost in Calderdale during the flooding? Actually we should not be guessing how much the damage is to our local economy following the flooding. So the UCVR has brokered a joint research project between Leeds University and Calderdale council. This is will be a major post flooding economic impact survey designed to provide accurate and credible data for representation to government and other agencies for business recovery support. 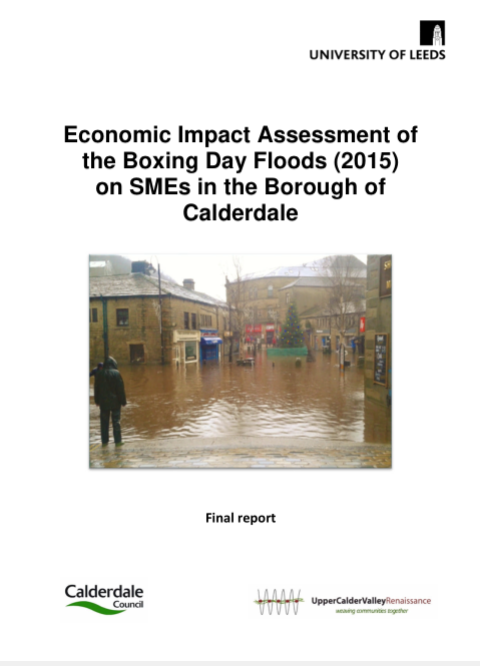 We now know over 900 businesses were directly affected by the recent flooding in Calderdale. Many more were indirectly affected due to the high level of business to business relationships in our area. It is now vitally important for the recovery of the local economy that we gather in-depth and reliable data to determine the real scale of the economic losses across our area and any potential losses going forward. As scientists are predicting more extreme weather events in the future, this data will also assist the assessment of how we can support businesses become more resilient both physically and economically should such flooding occur again across our area. If you are a business in the Calder valley directly or indirectly affected by the flooding please take the 20 minutes or so to complete this crucial survey. We only have a short window to present this data so please take part as soon as you can. We are in this together, let’s act together! What is our strategy for Business Recovery in the Upper Calder Valley? It is now seven weeks since the River Calder reminded us we are a valley united by natural forces. The UCVR exists because the valley is joined by a transport network, an inter-reliant economy, services and various other aspects of joint community life. Currently we are all still focussed on the recent flooding and how this has affected homes, businesses and tested the local authority’s ability to cope and plan for recovery with their cuts and staff reductions. From the outset we said we were not ‘first responders’ and had no resources to help in that way. We always said we would look after the interests of businesses and the economy, way beyond the period of fantastic community activities to support friends and colleagues we have seen thus far. We have been busy behind the scenes, we have opened a Business flood Recovery office in Hebden Bridge Town Hall and we are working with Calderdale Business Team on things like promoting resilience grants and researching those surveyors willing, able and available to do flood resilience survey. We have also been busy working with Leeds Business School to network both the University staff who can help us with more accurate economic impact assessments, business recovery and sustainably models. We have begun to network with the business alumni for specific skills we can call on to help our businesses during the recovery period. This is all at an early stage, but we have had a really positive response from the University and staff, living up to their stated community responsibilities. In collaboration with Calderdale Business Team and ’Business for Calderdale’, we will soon be undertaking of a wide ranging survey across the borough to get that comprehensive economic impact assessment mentioned above. We hope to get a separate breakdown for the upper valley so we can source our own recovery funding were appropriate projects present themselves. We are also collaborating with the Calderdale Flood Commission to ensure that this work will augment the work they are doing on impact assessment of the wider community and environment and infrastructure. We will keep you up to date on progress. Either here, or if you join our mailing list by emailing info@ucvr.org.uk or go to our contact page. Hosted by our partners Mytholmroyd Business Network Group we will be holding this event to provide information on post flood issues which businesses have told us in our flood impact survey that they have concerns about. We are asking people to register due to limited capacity. Should we find there are more people wanting to come than capacity we will hold another event as soon as we can. There is no parking available at the School. Also please consider parking will be an issue in Mytholmroyd so if you can do public transport or car share that would be great. Within two days of the floods which hit the Upper Calder Valley we asked businesses to respond to a flood impact survey. Despite their difficult circumstances business responded amazingly and we were able to provide almost instant data to Calderdale Council to support their bid for funds to National Government. Of the 337 businesses officially damaged by flooding in the Upper Calder Valley we had return of 43%. In Todmorden, Hebden Bridge and Mytholmroyd we had a return of around 60%. 31% said they would be open within weeks, 25% 1-2 months, 23% 2-6 months 6% said 6 months +, and 15% “not sure”. We believe that these figures will slide as we are hearing anecdotal evidence from more and more business that they are now expecting to have to take longer to get back into their property. We aim to repeat the survey after a month to review the figures. The survey results can be downloaded. Significant business losses, many business uninsured may not be able to return. The first thing we are doing with our partners in the Mytholmroyd Business Network Group is, holding a business breakfast on 19th January to bring together expertise in some of the areas mentioned in the “Main Requirements” such as insurance. The UCVR are already looking at these survey result with a view to supporting businesses who have to take longer to get back into business by introducing them to expertise in flood resilience and assisting them with applications for grant funding in this area. This will hopefully offer some future security of income if another flood were to occur. They would be able to recover more swiftly from the actual water damage. In the medium to long-term there is a need for both visitor economy promotions and general business development initiatives. The UCVR will fully engage with local, region and national authorities seek funding to undertake such promotions. We will engage with the serious debate about flood defence and water table management which will undoubtedly be the next phase the general community will want to discuss. Thank you to all businesses who have already filled out our survey. If you have not yet filled it in then could we ask that you do. The information collected will enable us to assess what businesses need. The UCVR was the first organisation to respond swiftly to the needs of businesses in Upper Calder Valley after the Boxing day floods. We set up a Business Recovery Team consisting of representatives of the three business associations in the valley. The purpose was to combine local business knowledge, representation and expertise. This was so that a strong collective voice could be heard from the valley wide community and not have each individual town struggle to be heard, or for resources. That team immediately set about surveying the businesses to see what their immediate needs are and what they will need in the weeks and months going forward. We have had a great response to our online survey and would urge businesses to continue to complete the survey. The data will initially be used by Calderdale Council to state the case for Government assistance but going forward we will use it to ensure that we can match any resources which are deployed to those who most need it. Whilst businesses were focusing on the clean-up of premises and assessing the damage, our priority was to collect information based on those individual assessments. As we collate that information coming in, our priority has been shifting to how to best help those businesses with the needs they have identified. We asked people with particular or professional skills, who maybe had not been able to physically help with the immediate clear up, to pledge time in the future to help with the recovery strategy. And we have had some response to this request but we could always do with more people to add to the skills pledge database. Our current focus is looking beyond the clear up and support for Calderdale’s funding bid. We are clear our businesses cannot rely on public support for donations in the way that people who have had their homes flooded can. So we are going to make the case for business to business support. We have as small team of volunteers who have begun the exercise of interviewing business owners who have had their businesses dramatically affected by the flooding. We will create a story blog of these personal stories and bring them to the attention of corporate organisation when asking for donations to help rebuild the valley wide economy. We know people will want to help individual friends with businesses and that is fantastic but in the long run a much bigger fund needs to be available from a central source so no one slips through the net. Since 2004 the UCVR has been the link between the communities of the valley and we are best placed to continue that linkage. We have the corporate structure and capable board to undertake the task of co-ordinating the valley wide business and economic recovery. But we can only do this with the continued co-operation of community organisations who have the wider community interests at heart. The alternative is a divisive ‘every business and town for itself’.